On Tuesday afternoon, McGill’s Student Housing and Hospitality Services organized a five-course tomato-themed meal that, true to its name, was an outright tomato fiesta. There was salsa, there was gazpacho, Greek salad, pizza with fresh tomato sauce, and there was even a 500-pound tomato cake. Nothing says community involvement like garlic, basil and fresh tomatoes. On Tuesday afternoon, McGill’s Student Housing and Hospitality Services organized a five-course tomato-themed meal that, true to its name, was an outright tomato fiesta. There was salsa, there was gazpacho, Greek salad, pizza with fresh tomato sauce, and there was even a 500-pound tomato cake. The meal, all prepared on the spot in a white tent on the lower field, involved more than 100 volunteer cooks, students and staff alike. 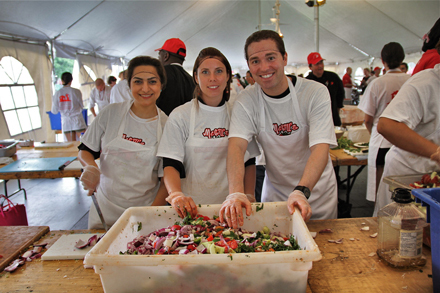 More than 2,000 pounds of the Greek salad, which boasted fresh tomatoes, sweet Vidalia onions, peppers and feta cheese, was donated to local charities Moisson Montreal, Meals on Wheels and the Old Brewery Mission. In addition to the collaboration with the various charities that help feed disadvantage Montrealers, the event also involved other members of the local community, with Compost Montreal on hand to collect the plates and utensils, and a McGill student jazz trio serenading the crowds. The idea for creating a tomato-themed menu rose from de Volpi’s love of the tomatoes grown at the Macdonald Campus farm at Sainte-Anne-de-Bellevue. The farm, under the direction of McGill Feeding McGill project leader Mike Bleho, provides locally grown fruits and vegetables to McGill’s downtown campus residences and student community. In the five years since the project’s inception, McGill Feeding McGill has served more than 1 million meals to students using this fresh produce. 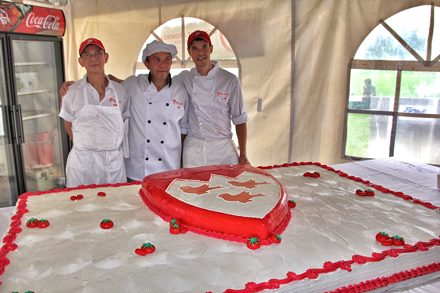 The 500-pound tomato cake, adorned with the McGill crest, quickly attracted the attention of the first-year students milling about the lower campus field for orientation activities. The lines for each of the five courses stretched dozens deep and students and staff relaxed in the afternoon sunshine with their meals, skillfully balancing full plates on their laps. To see a video of the event, click here.